Fig. 11-4. Block Diagram of a Generic TT&C Subsystem. This subsystem has full redundancy: two transponders with parallel transmit and receive signal paths. The dlplexer allows the same antenna to be used for transmitting and receiving. The band-reject filter attenuates spurious signals originating from the transmitter at the receiver's center frequency to help the dlplexer Isolate the receiver from the transmitter. The receiver's uplink path is as follows. 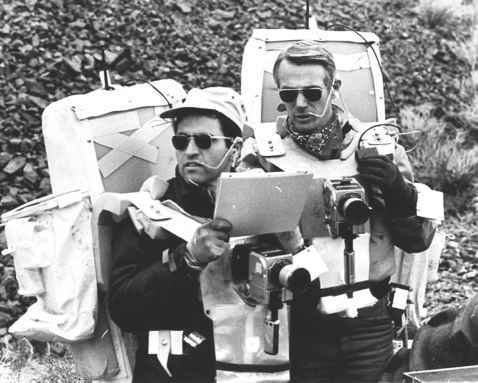 First, we assume the equipment modulates the digital command data onto a subcanier and further modulates the subcarrier onto the uplink-carrier frequency to form a composite uplink signal. Then, from the right of Fig. 11-4, the composite signal enters the subsystem through the antenna. The diplexer routes the composite signal to the receiver RF switch, which then selects antenna A or B and receiver A or B. The composite signal travels through the receiver's low-pass filter, which rejects unwanted transmitter harmonics and frequency spurs that may exist above the diplexer's stop band. The signal then moves into die transponder's receiver, which demodulates it and routes the digital-command bit stream to the command and data handling subsystem. Figure 11-5 diagrams a typical transponder. The composite uplink signal enters the receiver, where the command data stream is demodulated from die carrier and subcarrier. The data stream enters the command detector, which validates the stream and forwards the data and receiver-in-lock indicator to the command and data handling subsystem. The telemetry on the spacecraft's health and status, as well as the telemetry from the mission or science payload, enters the module that conditions it. The telemetry is modulated onto subcaniers (if applicable) and sent to the excitei/traiismitter to be modulated onto the carrier. If the transponder is in the two-way-coherent mode, the transmitter generates the downlink carrier with the reference frequency (coherent drive) from the receiver's voltage-controlled oscillator. The composite downlink signal then goes to the ground station for processing. Fig. 11-5. 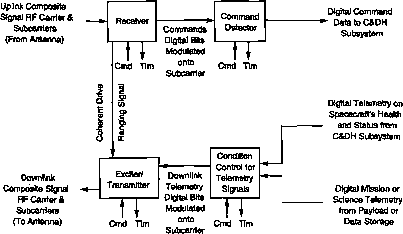 Block Diagram Showing How a Typical Transponder Works. The receiver is Isolated from the transmitter except for the ranging signal path and the coherent drive path. The coherent drive comes from the receiver's voltage-controlled oscillator when we want the downlink carrier to be a ratio of the uplink carrier. mitter, where it is conditioned and modulated onto the composite downlink carrier, amplified, and transmitted out of the transponder. In a typical 3-axis-stabilized satellite, we mount omni-antennas to the top and bottom of the satellite. We mount all ground-link antennas to provide an unobstructed view of Earth and place cross-link antennas to provide an unobstructed view of the relay satellite. Historically, the TT&C subsystem's electronics are as close to the antennas as possible. If we gimbal the antennas, we must make sure the satellite's body or other appendages such as the solar arrays do not obscure the antenna's field of view. Spin-stabilized satellites are usually cylindrical, and commonly contain a despun section. Except for omnidirectional varieties, we must mount antennas on the despun section. Frequently, we put the RF components and associated electronics on the despun section to avoid passing RF signals through rotary joints. From a TT&C point of view, satellites in LEO or in geosynchronous orbit are similar. The primary differences are the path losses. We compensate for these losses with either antenna gain or transmitter power. An interesting case involves an antenna beam providing spot communication from a LEO spacecraft for an area of the Earth. As the satellite ranges away from the coverage area, the antenna beamwidth to cover the area decreases. The increased antenna gain resulting from the narrow beamwidth compensates for the path loss based on the inverse square law. The longer distance demands no added transmitter power. Table 11-25 summarizes five ways we can apply a TT&C subsystem. For each application, the table specifies frequency, modulation, and common antenna characteristics.